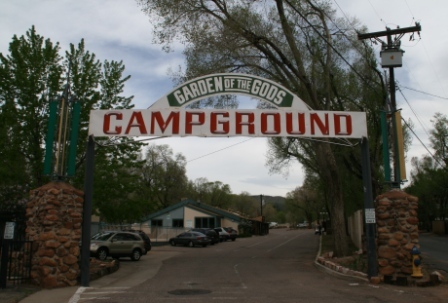 The Garden of the Gods Campground near Manitou Springs has been sold to a Memphis, Tenn.-based company as part of its expansion into the Western U.S. with a chain of outdoor and recreational vehicle resorts. RVC Outdoor Destinations bought the 13.3-acre property at 3704 W. Colorado Ave. from Farmers Insurance Group Federal Credit Union of California for an undisclosed price and is spending $200,000 to renovate the property, including resurfacing pools, improving existing RV sites and adding eight new concrete RV sites. The company is studying whether to spend at least another $200,000 on additional upgrades needed to bring it to the level of its six other RV resorts, said RVC President Andy Cates. The credit union ended up with the campground in June after a California-based partnership transferred ownership to it in the midst of a Chapter 11 bankruptcy case filed in 2010. The partnership owed the credit union more than $4 million it borrowed in 2006 to buy the property from local businessman Chuck Murphy. RVC plans to change the name of the campground to Garden of the Gods RV Resort within a few weeks and will bring it under the RVC Outdoor Destinations brand by year’s end. The 6-year-old company also owns RV resorts in Arkansas, Florida, Georgia and North Carolina that provide a variety of lodging options including RV sites, cottages and yurts and feature dog parks, swimming pools, boating and fishing rentals, refreshments, free wireless Internet and cable television service and gift shops.